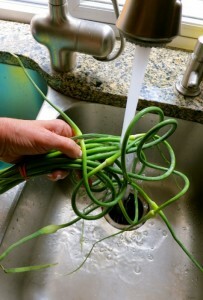 Scallions may be substituted for scapes in the recipe. Summer evenings and weekends — for many — are most enjoyed spent outdoors, and picnics are popping up across the landscape. We stuff baskets and coolers with “tote cuisine” and set camp beside lakes, wildflower-strewn meadows, and shady spots beneath trees. Simplicity is the hallmark of this al fresco dining, and an impulsive repast may be purchased on the fly. Stop by a favorite grocery and select some crusty bread, cheese, charcuterie and ripe cherries. Spread a batik cotton cloth over a picnic table and stuff a Bell jar with sunflowers, around which you arrange your store boughts; voila, a fast-food feast for the gods. The color recalls a Green Goddess dressing. Requiring more advance planning are foods that can be made in advance and taste even better after stewing in a cooler. Anything with local tomatoes and torn basil works, especially when using a starch such as pasta or day-old artisan bread cubes to soak up the juices. Sandwiches, cold, puréed soups poured from a thermos, and grain and vegetable salads are other picnic favorites. So more’s the pity to rule out summer’s signature, a lovely green salad. We remember the wilting leaves, bruising under the heat of a hot summer sun — unless, however, the green you choose is kale. 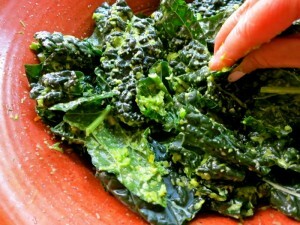 My friend Rebecca Bawkon enlightened me to the glorious heartiness of raw kale salads several years ago. Rebecca, a local wine connoisseur and food lover, offered up one of her favorite recipes for uncooked kale, made with a honey-lemon dressing. Until that time I’d never eaten it raw so was curious if it would be palatable. Massage dressing a bit into leaves to tenderize. She said the trick was to tenderize the kale by “massaging” the dressing into the leaves, then letting the salad sit outside the fridge to marinate and soften. It was delicious and maintained its texture even after sitting at room temperature a couple of hours; all the criteria for perfect picnic fare. The list of ingredients in the recipe below is chock-full of superfoods, which are foods rich in phytochemicals that have disease-fighting properties. Kale, packed with vitamins, minerals, antioxidants, and phytochemicals, make it one of the most nutritious green vegetables. The recipe’s health properties don’t stop at the greens. According to a medical review in Nutrition, Metabolism & Cardiovascular Disease, a daily consumption of a variety of grains, including farro, greatly reduces your risk for cardiiovascular disease. I’m always on the lookout for ways of incorporating grains, such as farro, into my diet, and recently saw an inspirational recipe using kale and farro on the website 101 Cookbooks. The author of the site, Heidi Swanson, used avocado in the salad, even incorporating smashed avocado into the dressing. This would be a marvelous addition to the recipe below, but I prefer eating avocado within minutes after removing from the shell. I used garlic scapes (the lime-green-colored stems of garlic plants) in the dressing, which I purchased at the Kerrytown Farmers Market. Scapes have a mild garlic flavor and slight sweetness, and are often used to make pesto or to sauté and season a variety of vegetables and proteins. Scapes may be hard to find, and you may substitute scallions if desired. Last weekend Richard and I hiked trails around beautiful Kensington Park in Milford, a 30-minute drive from Ann Arbor. We rewarded ourselves with a picnic lunch, which we spread in the shade of a large tree on Martindale Beach. Our menu consisted of old fashioned picnic favorites: cold fried chicken, stuffed eggs and a blueberry-lavender pie. This savory, toothsome salad was a wise addition, balancing the exigencies of our feast. With a sharp knife, remove center ribs from kale. Discard ribs or reserve for another use. 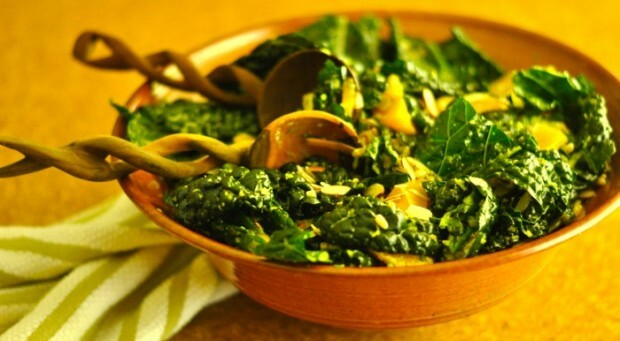 Chop kale leaves into 1-inch pieces; you should have about 8 cups. 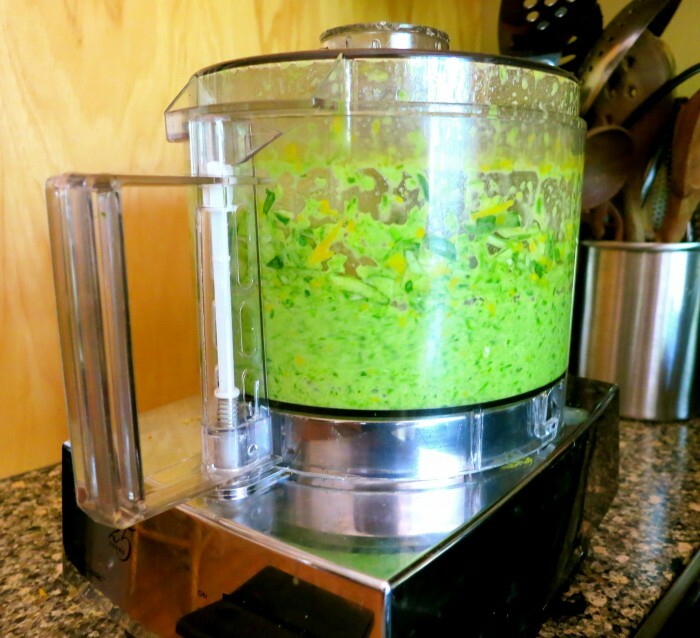 To make a dressing, place scapes or scallions into a food processor. Add olive oil, orange zest and juice, honey, parsley and tarragon; turn on machine and process until smooth. Massage dressing into kale leaves. Season to taste with kosher salt and freshly ground pepper. Toss kale with farro, orange slices, fennel, if using, and almonds.